This guide provides basic examples and details to assist in backing up the Print Manager Plus database. 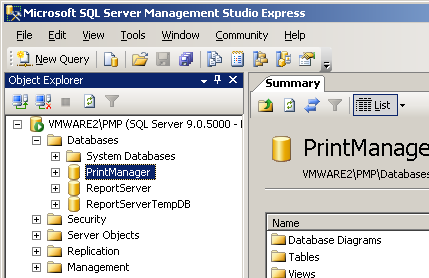 Print Manager Plus is designed to use either an MS Access, or MS SQL Database type. The process for backing up SQL Databases can vary depending on the version of SQL being used, and how that was setup. Your database may not be on the print server if a SQL Server within your network is being used. MS Access databases are simple files named PMPQuota.mdb that can be backed up. The first step in ensuring a successful database backup, is checking which type is being used. It is recommended to never assume the type. 3. The dialog that appears will provide the database type, and also information on where that database is located (Access Database), or where it is hosted from (SQL Databases). 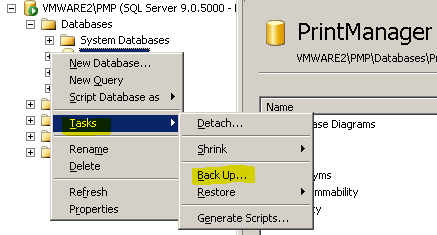 Once you have verified that you are using an MS SQL/MSDE database (see previous section) you can proceed to create a backup of that database. 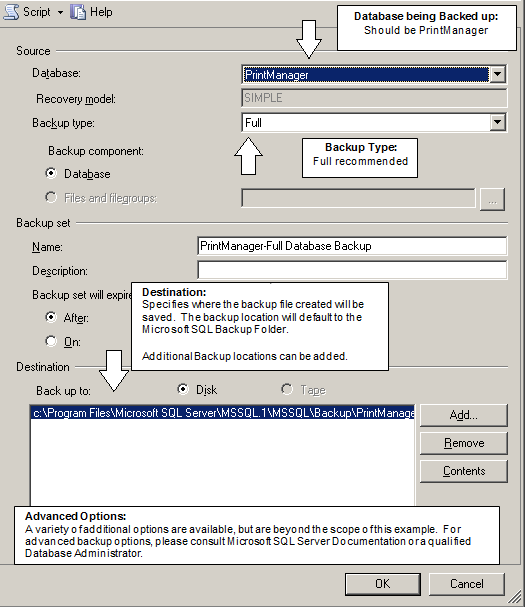 Creating a backup file is usually done using the SQL Management Studio from Microsoft. If you do not own this studio, Microsoft provides a free version called the SQL Management Studio Express. The following demonstrates a sample process of backing up the database. If you are uncertain if this process is correct, please contact your Database Administrator or Software Shelf Support. THis Management studio can be obtained free of charge from http://www.microsoft.com/downloads. a: Open the Print Manager Plus Administrator on one of your Print Servers. Within the program, go the File menu and choose Database Connection. b: Within Database Connection, note the entire string listed in the Microsoft SQL/MSDE Database Server box. 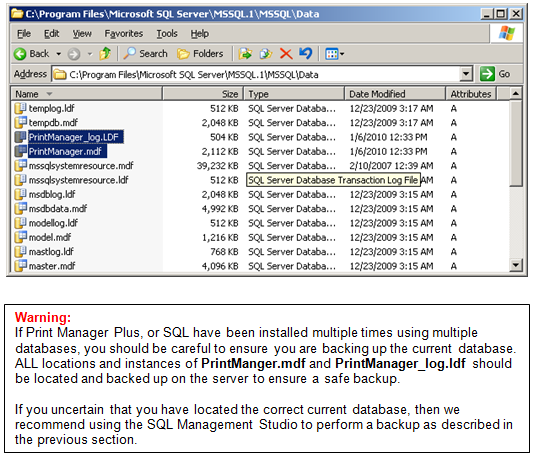 Now that you have connected to that SQL instance, you will want to browse the Databases folder and find the database namedPrintManager. a. Open the Print Manager Plus Administrator on one of your Print Servers. Within the Program, go to the File menu and chooseDatabase Connection. b. 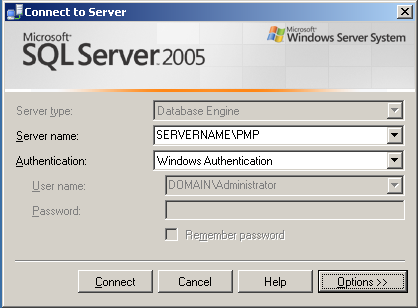 Within Database Connection, note the server name in the Microsoft SQL/MSDE Database text box. 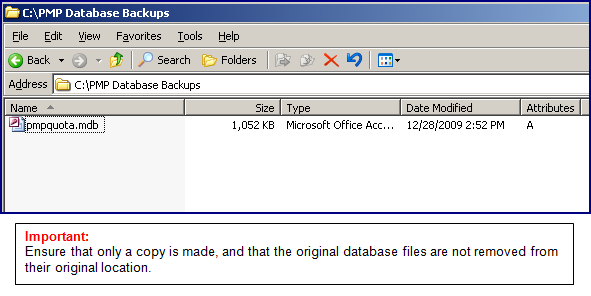 Making a backup copy of an MS Access database is a relatively easy backup process of one file named PMPQuota.mdb. FIrst you will want to verify the location of your MS Access Database. b. 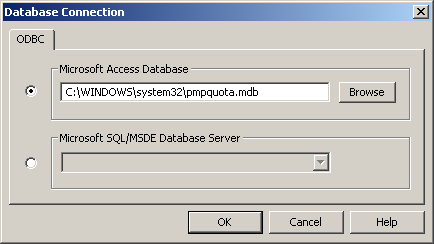 Within Database Connection, note the path to the PMPQuota.mdb file that is listed within the Microsoft Access Database text box. In this example, it is located in the System32 folder which is the default location. Next you should browse to the folder your MS Access database is in, and locate the file. Below is an example of it being found in its default location. You will want to make a copy of the file elsewhere. It's always recommended that backups be stored safely, and off the server in case of total server failure.